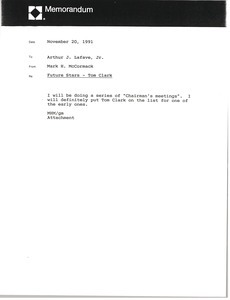 McCormack sends correspondence regarding Tom Clark. 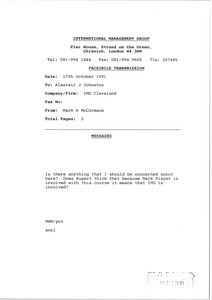 Forwarding a memo regarding the Milan office. Enclosure not with letter. 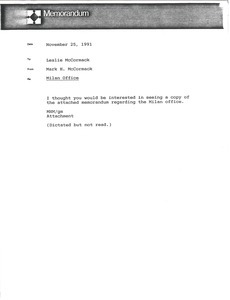 South Africa - McCormack sends a fax from Susan McMaster regarding International Management Group's involvement in the building of a golf course in South Africa. McCormack enjoyed their meeting in Chicago the week before, would like to have some IMG marketing people discuss Gatorade's marketing activities and objectives, and will keep an eye out for a summer internship for Smithburg's son. 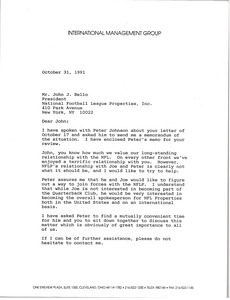 McCormack sends correspondence regarding National Football League Properties' relationship with Joe Montana and Peter Johnson. 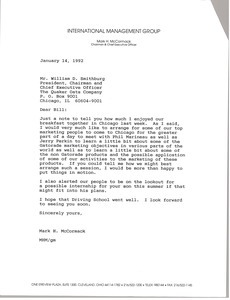 McCormack sends correspondence regarding the air travel policy and barter policy. 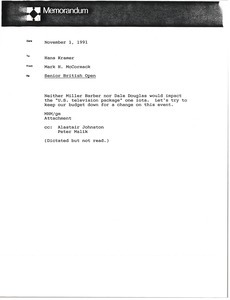 An invoice to Ian Todd for his airfare expenses is included. 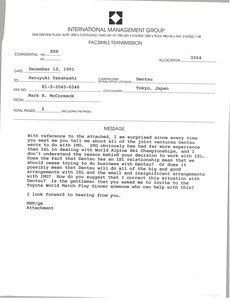 McCormack sends a memorandum Kramer wrote regarding Miller Barber and Dale Douglas' impact on the United States television package for the Senior British Open. Concerning the relationships between Dentsu, IMG, and ISL regarding the World Alpine Ski Championships. 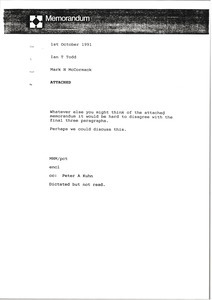 Attached not with fax. 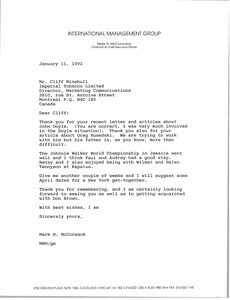 In response to Minshull's letter, McCormack thanks him for the articles, reports on the Johnnie Walker World Championship, and will get back to him about possible dates in April for a meeting in New York. 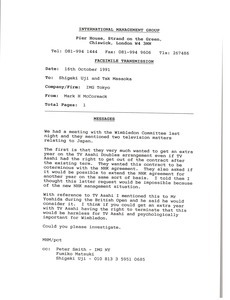 Japan - Concerning the Wimbledon Committee's discussions about television matters relating to Japan, particularly agreements with TV Asahi and NHK.